OptimMSM is produced from plant lignin. The lignin is derived from trees. Lignin is like a glue that holds the fibers together. OptiMSM contains no animal ingredients. It is free of yeast, lactose, starch, gluten, preservatives, artificial flavor and taste. In nature, MSM can be found in rainwater and fresh fruits and vegetables. The organic sulfur compound is odorless and is a key component in many enzymes, in cartilage and in many other important compounds and structures in the body. Sulfur naturally found in foodstuffs can be destroyed by heat. In the body, sulfur is particularly found is protein-rich tissues. MSM (methylsulfonylmethane) is a nutrient that is present in the normal diet of humans and most other animals. 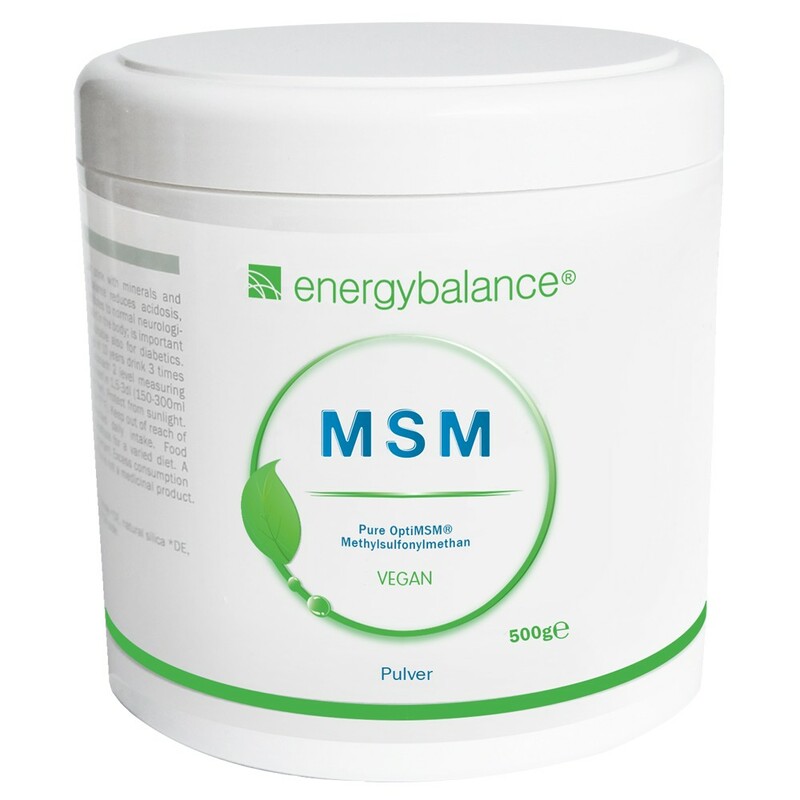 MSM is comprised of 34% sulfur, the fourth most abundant mineral in the human body. It serves as an important food source for bioavailable sulfur, an element that plays a critical role in maintaining the integrity and elasticity of the connective tissues and other tissues. It is an important component of proteins in the body, eg. as in hair, nails, skin and tendons. Our Immunystem depends on sulfur, since many enzymes and hormones can only be made with sulfur. The for the liver so important amino acids are containing the sulfur component. Several preclinical and clinical studies support the effectiveness of MSM in support of the musculoskeletal system. Research shows that MSM reduced in the aging process inflammatory markers in cartilage damage, and protects its integrity. A review by S. Brien, P. Prescott, N. Bashir, H. Lewith and G. Lewith by randomized controlled trials with methylsulfonylmethane in knee osteoarthritis showed a significant improvement in pain in the treatment group compared to the placebo group. Stanley W. Jacob, co-author of a book to promote MSM, reported that MSM was administered at a number of compaints affected group of more than 18,000 patients, and all indications are that the people had large sulfur deficiencies in their daily food intake. In the majority of alternative medical literature that support MSM - draws a common picture that the average diet of methylsulfonylmethane is deficient because during conventional food preparation as fry, steam, boil and pasteurize it immediately got lost. OptiMSM is the only premium quality in the market. OptiMSM removes in a proprietary four-stage distillation process heavy metals and other impurities. Other MSM sources are purified by crystallization and may contain impurities because the contamination present in the solution may be enclosed during the crystallization process. Dissolve 1 heaped measuring spoon* (=1 g) in water, tea or juice and drink. For exact intake, please read the "Recommended daily intake" on the label. *The measuring spoon is provided in the jar. OptiMSM (MethylSulfonylMethan) powder, silicon dioxide 0,1%.